Stir frying is a fast, healthy way to cook because the recipes are generally easy to prepare, include a lot of vegetables, and are fast enough to fit our on-the-go lifestyles. So you’ve bought all the ingredients to make the perfect stir-fry meal: chicken, vegetables and your favorite sauce. But as you gather your ingredients, don’t overlook one of the most important components: the right cooking oil. With so many options available, choosing the best oil may appear daunting. Relax! With Carotino Red Palm & Canola Oil, your meals may be even healthier and tastier. Even when used at high temperatures, Carotino oil won’t break down and your food won’t taste scorched. It also retains almost all of its antioxidants, vitamins A and E, and Omega 3 and 6 fatty acids. Here are four more tips to help you be successful with your next stir-fried meal. Choose aluminum cookware. Whether you’re using a wok or skillet, aluminum pans are the way to go. They are safe to use at high temperatures, and are perfect for searing meats, fish or poultry to achieve a browned, caramelized crust. Some home cooks prefer to avoid using nonstick cookware at high temperatures because some studies suggest it may break down and give off toxic fumes. Use a gas cooktop. It’s very important to have control during high-heat cooking. Using a gas burner will enable you to increase or decrease the temperature level at a moment’s notice, preventing any potential burning or even worse … a hungry family. If you have an electric stove, try switching from an aluminum to a cast-iron pan. Cast iron holds and sustains the high temperatures needed for stir frying, so food cooks evenly. Prepare your ingredients ahead of time. 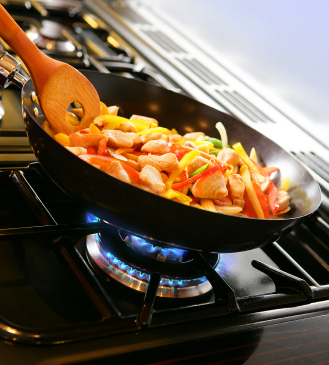 Preparation is important for any type of cooking, but especially when you stir fry. Once you start cooking, you won’t have time to slice and dice. Have all of your meats and vegetables chopped and ready to go before you start. Begin by cooking proteins, which take the longest cooking time. Then remove them from the pan, cover and keep warm. After your vegetables are almost cooked and caramelized, the meat will go back in. This way, the meat will not be overcooked and each ingredient keeps its distinct flavor. Use a wooden spoon. These are optimal because they won’t melt if left resting on a pan. They are also insulated so you won’t burn your hand as you might if you used a metal spoon to stir hot foods. With Carotino oil and these four tips, high-heat cooking can be part of your weekly repertoire. Try testing your new skills by preparing our Carotino Chicken Stir Fry recipe. This dish has a mild blend of traditional Asian flavors, and is packed with antioxidants and vitamins. ← Where does red palm fruit oil come from?